EverBank $75 Bonus: Get $50 cash bonus for a new EverBank Yield Pledge Account plus another $25 for a new FreeNet Checking Account (details). ING Direct $25 Bonus: Use any of the referral links to open an ING Direct Orange Savings Account, Electric Checking Account, or Business Account and receive $25 cash bonus. Lending Club $25 Bonus: Become a lender at Lending Club and receive $25 bonus to begin lending. OptionsHouse One-Year Free The Wall Street Journal Subscription: Receive free one-year subscriptions to The Wall Street Journal when opening an OptionsHouse brokerage account before October 31, 2010 (details). 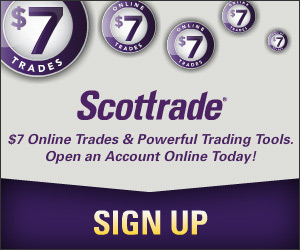 Scottrade 3 Commission Free Trades: Get 3 commission free trades from Scottrade when you open a Scottrade brokerage account using promotion code KGKP0724 (details). E-Trade Financial Free Trades for 60 Days: Get up to $500 trade commission to trade free in the first 60 days after opening a E-Trade brokerage account. Chase Freedom Card $100 Bonus: Receive $100 bonus after spending $500 in the first three months of card membership. Citi Business/AAdvantage Card 30,000 Bonus Miles: Apply for the Visa card, spend $750 in the first four months, and receive 30,000 American Airlines AAdvantage bonus miles (details). AT&T Universal Card $50 Bonus: Earn $50 statement credit after using the new AT&T Universal Savings & Rewards Card to make $50 purchase in the first 3 months (details). Citi Forward Card $200 Gift Certificate: Receive a $200 Restaurant.com gift certificate after using your new Citi Forward Card to make at least $100 purchase between now and September 15, 2010. Interested in learning the difference between the various online institutions: specifically ING vs. Ally bank. I’m shopping for CD’s and I know ING used to be popular 2 years ago, but less so now, and Ally seems to be more prevalent now… any thoughts? A $200 restaurant.com gift certificate (being offered with Citi Forward) is NOT worth $200. A $25 gift certificate (which is actually a high value coupon with other purchase requires) goes for $10 at list but is typically available for $2-4. So that $200 is worth $32 at most, and $16 if you were to buy them at 80% off. New Overdraft Law: Is It Good?